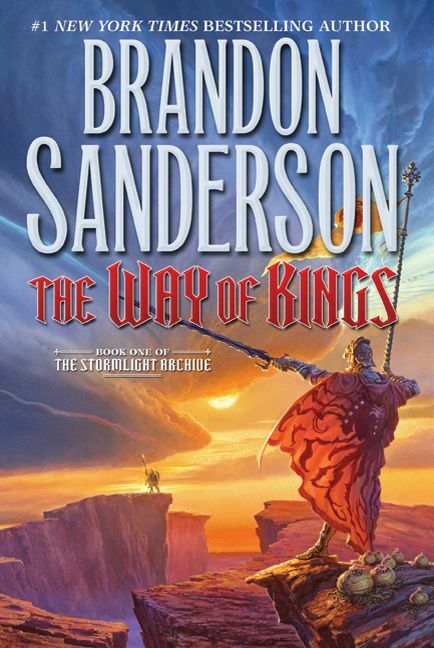 The readalong for The Way of Kings by Brandon Sanderson continues. If you want to join in or find other thoughts on the book, check out the Polishing Mud Balls Readalong Page. Late again! I had a book club last night that I had to cram in a couple hundred pages for, so I had put off answering questions and visiting others. Sad. But the book club I went to was fabulous, so I guess it's really all good. Also, I keep forgetting to say this: Spoilers follow! I finished up Part 4 on Saturday night, and just had to go on to finish the book. When you're looking at just 40 more pages (in the hardcover edition), it's really hard to stop. I will keep from spoiling any of those 40 pages though. He hasn't really expressed anything definitive yet (that I can tell), but I find his exploration of religious faith very interesting. Even though I am a religious person who attends church regularly, I have times that I struggle with faith. I came into this world a skeptical person, and am constantly questioning everything about everything, religious or not (I think Jasnah would be proud of me--I'm not sure if that's a good thing...). Because of this, I always try to focus on certain "things" that I know are true, because I need something to serve as an anchor in life. One of those things is that it is good to serve and love others and try to relieve suffering where possible. The reason I bring this up is because I see each of the main characters in the book doing the same thing--some sort of a guiding principle even if they haven't figured out what to believe in. Kaladin is unsure about a lot of things, but has a core belief that you save life when possible and you don't leave a man behind. Dalinar clings to his ideal of honor and integrity through The Codes and what he is learning in The Way of Kings. Jasnah finds value in knowledge as a source of truth, and that is what guides her life. Shallan is an exception, because she seems to have the faith in the established religion, but is learning through Jasnah to question her beliefs, not in order to prove them false, but to expand her knowledge and understanding. I know Jasnah is referred to as an atheist in the book, but she strikes me more as an agnostic. All in all, I think Sanderson is trying to represent how characters live their lives while they try to figure out questions of faith. I feel like we've only just scratched the surface of these relationships, with little hints of more drama yet to be revealed, past and present. I like Adolin, but Renarin intrigues me more. I would love to find out more about Gavilar, especially since Navani makes a comment that suggests he was not necessarily an honorable man. Well, honestly, I have a little crush on Kaladin, so I don't need any breaks from him. I'm good with the "exploring" and all ;-) From a more literary stance, the continuity of one character gives such a long book a focal point and ties everything together a bit. I think we're far along enough in the book for me to confess that at first she reminded me of Tinkerbell. This was not a positive thing for me. Luckily she changed and matured enough to help me to let go of that image of her. I like her more as she gains more wisdom, but at the same time it's somewhat poignant to see her grasp the dark side of life and of human nature. I have already finished, but I will predict that I will be happily reading the book again before the next one comes out. It is with great self-discipline that I put down the book before getting too far into Part Four. Doesn't it just sound weird to say "Only 300 pages left?" Kind of like getting excited that gas is now only $3.66 . . . But of course I would rather read this book, even hundreds more pages of it, than fill up my tank. I am finding Sanderson's doorstop to be such a page-turner, that I may even end up reading it while filling up my tank because I won't be able to put it down. 1. Part III reunites us with Shallan, who we haven't seen for a few hundred pages, and separates us from Dalinar and Adolin for a few hundred more. How do you feel about leaving characters behind for such long stretches? Did you lose any of your connection to them during the break? Somehow it works for me, even though some of the story lines/characters are left for hundreds of pages. I had mentioned somewhere that I didn't miss Shallan much during Part II, but when she returned in Part III, I was riveted. Kabsal freaked me out and I was trying to figure out if he was up to something. I just kept wondering what was up with all that bread and jam! But then there are a lot of things that just don't seem to add up about Jasnah's explanation of the poisoning. I seriously do not know who to trust! If Jasnah is lying, why? Is it just another "hands-on" lesson? Did she do some soulcasting when she put her finger in the jam? Does that mean that she has a functioning soulcaster or doesn't need one? Or did she just simply want to smell the darn jam? At one point I even thought Kabsal was working as sort of a spy for Jasnah to find out more about Shallan. I don't get that idea now. I have a million more ideas and questions about this whole storyline, so I'll just stop here. I also didn't miss Dalinar, but now that I am beginning Part 4, I'm just as enthralled. There is so much I want to know about the visions. And still, why his memories of his wife have been erased. For something that has only been mentioned a couple of times, it occupies a lot of my thoughts! 2. So far, how would you compare this to other epic fantasies you've read? Does it remind you of any other series? It does strike me as different than the fantasy I've read. I have felt more of a connection to our world in other books, whereas Roshar seems quite alien. Maybe I haven't read enough other fantasy to compare, but The Way of Kings seems quite unique. Originality jumps out of every page. 3. How do you feel about the masculine and feminine arts? If you're female, do you think you'd be content to stick to scholaly pursuits, or would you rather do something physical, like go to war? If you're male, would you be willing to forgo learning to read, even if there were women around to read to you? What about the food? Does the spicy for men and sweet for women restriction fit your own tastes? I think if I ate all those sweets I'd be fat and my teeth would fall out. What guy would want me reading to him then? 4. What do you think of the flashbacks to Kaladin's childhood? I look forward to them as they piece together the events in his life that have led him to his present condition. He seems to have a pattern of depression that leads him to the brink and then he comes back even stronger. Of course I wonder in each chapter of his past if we will finally find out the exact details of Tien's death. I was a little vexed when that period of time gets skipped over and we return to the original battle scene from the beginning. I liked the way we got a different perspective of the battle, and it made me appreciate more that the first time it was from Cenn's perspective. In a nutshell, I want to see Kaladin and his group to escape, I want Dalinar's visions to be believed, and I have no clue what I want for Shallan. But what I want may not be what's best for the story. I'm sure Sanderson will play around a bit with what the reader wants to have happen, and what will actually happen. I hope so. I'm mostly hoping that at least a couple of things will have some closure, and that not everything is left for the rest of the series. At this point, still more questions than answers. Love it! Welcome to the next stop of the Steinbeck Tour! 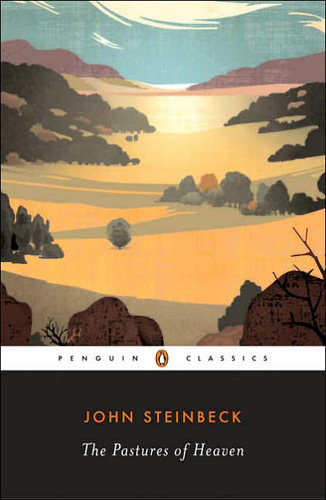 The Pastures of Heaven is the first of Steinbeck's California works, set in the farm country near his hometown of Salinas. 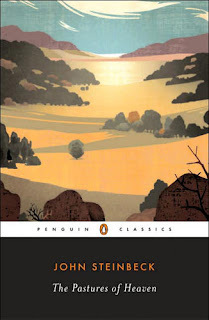 Published in 1932, this work precedes his popularity and financial success, but introduces the reader to Steinbeck's style and the genesis of the themes that he explores in later, better-known novels. In this collection of short stories, we meet a community of families living in a beautiful verdant valley full of promise, finding that life can be rather ugly, and their own imperfections and the pressures to conform to society don't help at all. "It's good land," they said, "but I wouldn't own it if you gave it to me. I don't know what's the matter, but there's sure something funny about that place, almost creepy. Wouldn't be hard for a fellow to believe in haunts"'(12). "Maybe your curse and the farm's curse has mated and gone into a gopher hole like a pair of rattlesnakes. Maybe there'll be a lot of baby curses crawling around the Pastures first thing we know"(19). How inventive these farmers are! Not to mention foreshadowing that bonks you on the head and propels you to read on. What follows is a collection of stories (or as Steinbeck describes them, "tiny novels"), each depicting a different family living in the Pastures, touched in some inadvertent, but disastrous way by those "lucky" Munroes. Besides being engaging stories with superb characterizations and vivid descriptions of the setting, this short-story cycle is exciting to read because within are found the origins of Steinbeck's most powerful themes and landscapes that emerge in later and more celebrated works. Included is a cast of flawed characters struggling against forces out of their control. Their dreams and self-delusions crumble in the face of reality. Even in a place with the such a promising name, the Pastures of Heaven offers little solace and satisfaction to its residents. ". . .Of anything I have ever tried, I am fondest of these and more closely tied to them. There is no grand writing nor any grand theme, but I love the stories very much." I loved the stories very much as well, but I disagree with him about the writing and theme--I don't know about "grand" but both can surely be found in satisfying quantities within this short-story collection. I appreciate the interludes both in terms of breaking up the larger story and in the actual content. In terms of geography, it feels like adding pieces to a puzzle to get a bigger picture of Roshar. I love that we find out more about Szeth's place of origin through Rysn and that we get a picture of Shallan's homefront from her brother's part. I also like the contrast between the Alethis who glorify warfare, and the Shin, who give most respect to the farmers--those who "add" rather than take away. And the chapter about Axies the Collector was just hilarious! It was perfect placement for a chapter like that. I haven't had many thoughts about this, so I look forward to reading everyone else's :-). I yearn for someone to trust in Dalinar's visions, and I'm curious about why he wiped his memory of his wife. Wit seems to have jumped right out of a Shakespearean play. I love the concept of the ten heartbeats to summon a Shardblade. I have enjoyed reading about Kaladin's efforts to bring some humanity and dignity back into an almost hopeless situation, and the fact that he never gives up. Syl's effect on Kal is very similar to Tien's effect on him in his youth. I'm wondering about the relationship there. I like that concept. It seems like the magic is already there, but in a dormant state, much like the vegetation (okay, maybe I do have a thought on the ecology). Syl seems to be a manifestation of the magic coming back to life. I've spent way too much time pondering what they mean and going back to string them together so much that I almost wish they weren't there. I should just skim and move on! I liked how we got to actually see someone in the main storyline making one of those before-death statements that we saw in Part One, but I still don't understand their significance. I think Sanderson mentions this in the interview, but I like the relationship being set up between science and magic. The decayspren are analogous to bacteria, and I always think of endorphins when the gloryspren emerge. The Way of Kings book that they refer to seems very Confucian to me in its ideas. A lot seems to hinge on the highstorms. They're destructive and yet bring light and power. Overall, isn't it great to be about halfway? The huge hardcover is now more balanced between my hands and I think I can throw in a few triceps presses now and then. The Steinbeck Classics Tour begins today and ends August 26. 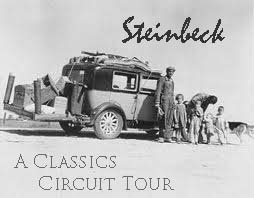 If you're interested in following the tour, check out the schedule at The Classics Circuit website. I will be posting my thoughts on The Pastures of Heaven on Thursday. Never heard of it? Neither had I. I really liked it, but hopefully I'll have more than that to say about it on Thursday. I am listening to: Two of my girls playing the piano and singing. (I just heard one of them say to the other, "Are you saying eww to my singing?") Also my son is editing footage from a "game show" all of the cousins acted out this weekend. I am watching: Doc Martin via Netflix Instantplay. I love this show! Just starting with Series 2. I am thinking: So many things I need to write them down on paper. I call this my "brain-barf list." Lovely name, huh? I am grateful for: A home, cars to drive, food to eat, healthy kids, the freedom and time to read and study. I am reading: The same things as two weeks ago . 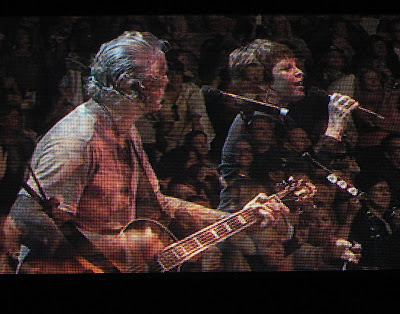 . . Really enjoying The Way of Kings. Pat Benatar/Neil Giraldo concert, shot of screen while singing "We Belong." Awesome night! My new nephew-dog(?) 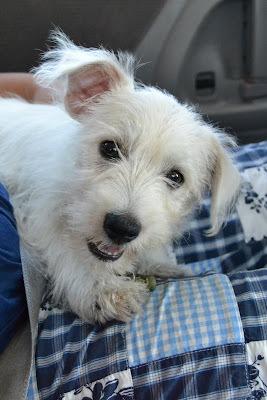 driving home from getting him at the airport. 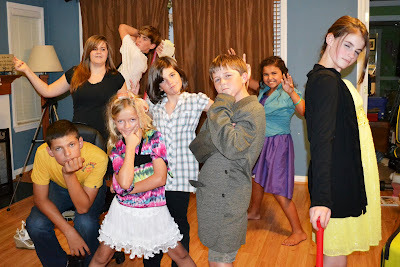 Cousin sleepover, in the middle of their latest cinematic caper. 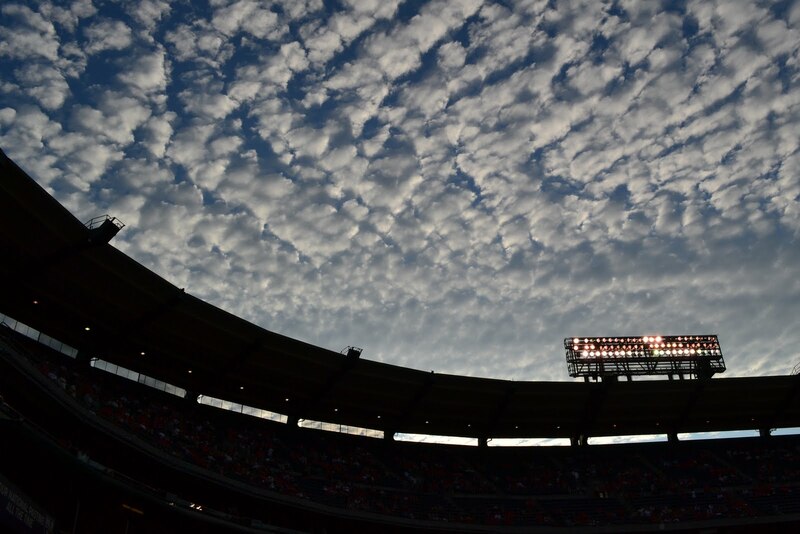 A shot of the sky during a baseball game. I am listing: Characters, creatures, places, nationalities, etc. found in The Way of Kings. It's a long list so far. I am creating: Does the blanket I started crocheting for my daughter three years ago count? Around the house: I have been pretty grumpy about housework. I just feel so sick of it. The same things getting cleaned and messed up over and over and over. I asked my husband if we could somehow eradicate housework, and he said we could if we got rid of the house. Point taken. In the kitchen: Just trying to meet my goal of making dinner every night at home. Summer was a little crazy as far as family dinners go, and I'm happy to get back into a routine. Tonight: Spaghetti, veggies, and garlic bread sticks. Basic works. One of my favorite things: ZUMBA! I've been doing it for over a year now, and it's so much fun. The children these last two weeks: Started school! Plans for the week: Two Back-to-School Nights, one orthodontist appointment, one eye appointment, three dentist appointments, and a bunch of other mundane activities. Starting jogging again after two months off. I weigh a little less, so it should be easier, right? In (or around) this date: Nothing particularly noteworthy. August does not seem to be conducive to blogging whatever the year. Post format swiped from Polishing Mud Balls. Another readalong! I love it. Readalongs are one of the main reasons I keep up with this somewhat sporadic blog. If you would like to join in or read other reactions to the book, check out the Polishing Mud Balls Readalong Page. 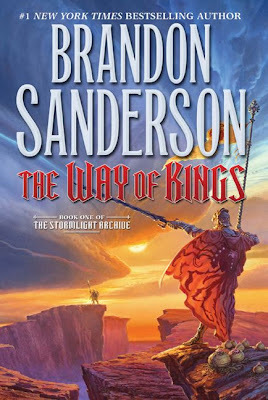 What a promising beginning for The Way of Kings by Brandon Sanderson! I had very few expectations, and have never read anything by him before. So far it has been quite a visual feast, both in the actual maps and illustrations, and in the vivid descriptions of the different ethnic groups, the physical manifestations of emotions seen in the "spren," and the brilliance I picture in the Stormlight and the Soulcasting. I also love Kaladin. I know that main characters don't necessarily have to be likeable to make a book worth reading, but I sure like it when I do latch on to someone so loveable. Here are the readalong questions for Part One, provided by Deanna of Polishing Mud Balls. My answers are somewhat spoilerish, but really not so much as this is only the first fifth of the book. My main thought going into this book was wondering what I may be getting myself into with a ten book series. I mean, I've only read through Book Two of the Wheel of Time. But I suppose I'll have plenty of time between the publishing of Sanderson's books to read Jordan's (and technically, more of Sanderson's). But I also know that if it's good, I will be thrilled that there will be nine more. So far, it's looking that way. 2. What do you think of the pace of this story so far? And what do you think of the prose? Do you think the prose is too descriptive? Not descriptive enough? Give me your thoughts on the writing thus far. The pacing is good for me. I can tell he's taking his time telling the story and not leaving any detail out, but I am enjoying that aspect about it. It's a fast read, which has been a relief since I've been short on time. I know it's a pretty basic format, but I love the switching from one character's story to another. I like how each major character has their own graphic at the head of each chapter. I'm very curious about the statements from people before death. Is it Kaladin's father who records these? Does it have anything to do with the one who was abandoned in the prologue? I always love it when someone is successful in overcoming an obstacle so of course I wanted to cheer when Shallan is accepted as Jasnah's ward and when Kaladin reclaims his will to live (not to mention giving Gaz what he deserved). Both Kaladin and Shallan are interesting of course, but a minor character I was intrigued by was Shallan's brother, Nan Balat. He seems like a nice enough guy, but he likes to kill animals. What part will he play in the rest of the novel, if any? I also feel for Szeth, who hates to kill, but must obey any orders. Will he ever be free of this power over him? I really like it so far. I can't be specific, really. It's just one of those books that I like the way it makes me feel. I can get a little lost in the world that has been created, and feel invested in the fortunes of the main characters. I'm I love that I have lots of questions. I'm curious about the different classifications and gender roles that the different areas have and what role they will play in the story. If I'm being nit-picky, I would complain about a couple of minor things. First of all, I felt as though Cenn would be a main character because we see that battle scene from his perspective. And then he died. Did the scene have to be centered on him? It shows us Kaladin's character and all, but I wonder why Sanderson chose to present it that way. The other thing (and I realize this is rather silly), is that I would like to see a little more variety in the swear words. Everything is "Storm" this and "Storm" that. I need a little variety in my fantasy-world profanity!